It's Treyarch, and not series creators Infinity Ward, that will be setting the pace for the Call of Duty series. According to Activision CEO Bobby Kotick, Treyarch's upcoming Cold War shooter Call of Duty: Black Ops is a roadmap to what the next five years worth of Call of Duty games will be like. 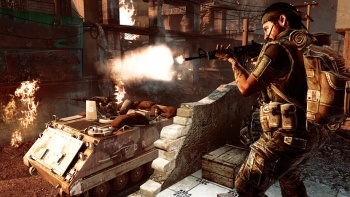 Speaking at the Deutsche Bank 2010 Technology Conference, Kotick said that Black Ops showed off both the visual style of future games, and how they stories and characters would be put together. Future releases would improve on the quality, and the games would become more cinematic, with more in-depth and "real" plots. He also said that Move and Kinect would allow the integration of motion and voice controls, bringing big changes to the gameplay. But Kotick made it clear that new ideas would be added too, and mentioned the wager matches - four game modes in Black Ops that allow players to gamble in-game currency on their match performance - as an example of one area where the Call of Duty series was innovating. He also said that DLC was going to play a big part in the future of Call of Duty, and that Activision would be stepping up its release schedule for new content. Without actually playing Black Ops it's hard to say whether its use as a template is good or bad. It certainly sounds good, but we'll have to wait and see. It's also going to be interesting to see what Infinity Ward or Sledgehammer do if Black Ops is going to be their style guide. Black Ops is coming out for Wii, Xbox 360, PC and PS3 on November 9th.